Ed Sheeran’s Shape of You debuted at number 1 on the Billboard Hot 100 chart, getting over 20 million streams in its first week week and giving the singer his first number 1 hit in the US. So, how did Sheeran make it to the top spot? In this article, we break down what made this track an instant chart-topper. Slower tempos and minor keys have been a trend in chart-topping songs for the past year, and Sheeran put this winning formula to use in Shape of You. Eight of the 12 songs that reached number 1 on the Billboard charts last year - from Drake’s One Dance to Rihanna’s Work - had tempos slower than 104bpm. At 96bpm, Shape of You proves that the shift to slower tempos is still trendy. Over half of the songs that made it to the Billboard Hot 100 songs in 2015 were written in major keys. However, seven of the 12 songs that made number 1 in 2016 were written in minor keys. Sheeran’s latest hit, written in C# minor, follows in the footsteps of the many recent minor-key chart-toppers, including Adele’s Hello, which took home Song of the Year at the Grammys. Minimalism is in. Just take a listen to Migos’ Bad and Boujee and Bruno Mars’ That’s What I Like, currently numbers 2 and 3 respectively on the Billboard Hot 100, and you can immediately hear how light the instrumentation is. 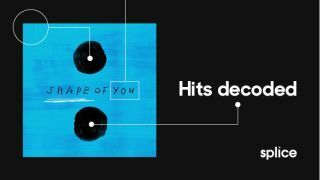 The same goes for Shape of You; large sections of the song have only two or three instrument parts playing at the same time. We don’t even get a kick drum until the first chorus, almost a minute into the song, and the bass doesn’t come in until even later. However, the track still feels full. For the verses, the marimba fills up the low end, the guitar-tapping percussion fills up the high frequency spectrum, and Sheeran’s vocals nicely occupy that all-important mid-range. Changes in dynamics and energetic percussive elements - claps, guitar strums, the well-timed punchy snare sample - keep the listener interested for the nearly four-minute song. Splice has compiled a collection of samples that sound like the instruments found in Shape of You so you can test your production chops by recreating the song, or make your own would-be chart-topper. Check it out on the Splice website.